Nobody will deny that 2013 was disappointing for Chudzinski and the Browns. They had a promising 3-2 start and after a solid victory over the Ravens at home in week nine, they were 4-5 going into the bye. From there, the Browns lost seven games in a row to finish 4-12. For a team that had high hopes for playoff contention after spending some coin in the offseason, going backwards in the win column from a 5-11 2012 was certainly an unwelcome development. But let's be real here, Chudzinski did not have much to work with offensively, most notably at quarterback. The Browns had three different quarterbacks take snaps under center and save for Brian Hoyer, who was excellent in his three starts before getting lost for the season due to a torn ACL against Buffalo in week five, none were impressive. That includes Brandon Weeden, who was a holdover from the prior administration and was a complete mess all season long. Therefore, the strong breakout seasons for wideout Josh Gordon and tight end Jordan Cameron were largely put to waste. And it was thought with the trade of Trent Richardson that the team was rebuilding and likely to take a quarterback next year in the draft. Speaking of the Richardson deal, it was a good move in that it brought them a first for a guy that was overrated but it also rid them of any threat at running back. Without players in the backfield, Chudzinski was going to be at a disadvantage. And another major reason why this move came as a surprise came with the proclamations that times have changed for the Browns under new ownership, Jimmy Haslam, and under yet another front office contingent of president Joe Banner and general manager Michael Lombardi. Peter King dug up a couple of key quotes from Haslam, formerly a minority owner of the Steelers, that seemed to signify a chancing of the guard. "They've averaged a new coach once every 2.8 years [since the franchise returned to Cleveland in 1999], and that's just not a good recipe." "One thing I learned from watching the Steelers is the importance of consistency in coaching, and how much it sets you back when you're always making a change. When you change coaches, it can be a three- or four-year deal to get back." 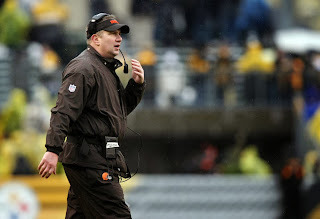 So what have the Browns done under his year and a half of Haslam's ownership? They have fired two coaches in two years. Now the firing of Shurmur was one thing, the new brass didn't hire him and wanted to hire their own guy and Shurmur wasn't an impressive coach, but now after they have brought in their own guy after coming close to getting Chip Kelly last offseason, they dump him after one season. The Browns released a statement last night saying, among other things, that they needed to see progress, the losing streak was a concern, there's a high "urgency for success," and all the usual blather. Albert Breer reported that Chudzinski was told to cut a player and refused as well as not holding guys like Weeden and Greg Little accountable (interesting that neither saw that much playing time down the stretch as is). And now, Ian Rapoport reported that the team will look for a new coach with the current coaching staff in place, which is very unusual because traditionally a new coach gets the chance to bring in his own guys (although could this mean we see the immortal Norv Turner get promoted to the head job?). And it appears that, according to King and Mike Silver, that Cleveland players are far from pleased at this development.